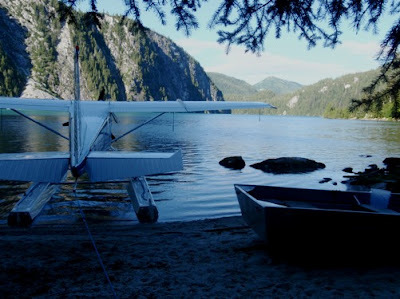 Baranof Lake and Warm Springs Bay are one of my favorite stops of the trip. 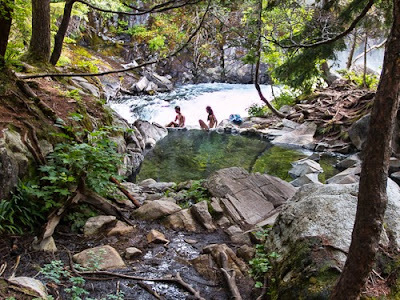 After a few weeks in cabins, even with a sun shower, there is nothing like a serious long hot bath. Warm Springs Bay has two options. Looking at my map of the area the anchor represents the seaplane dock. You can tie up and walk 100 feet and you are in a free bath tub which is about six feet long and 30 inches deep, big enough for two friendly people. There is also a shelter near the dock if you could not get into the lake cabin for some reason. It is not really designed for that but in a pinch it would work. 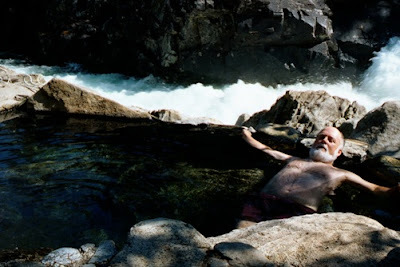 If you do not like the tubs and want to take a one half mile hike to one of the two best hot springs I have ever seen. The temperature is perfect and there is a raging river ten feet away. 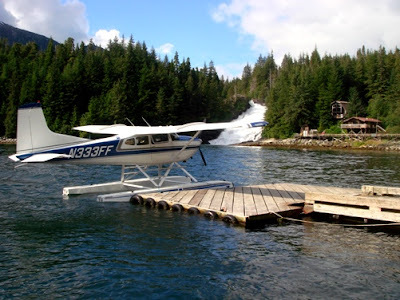 After you are clean hop back into the plane and go to one of the most scenic cabins in Alaska. 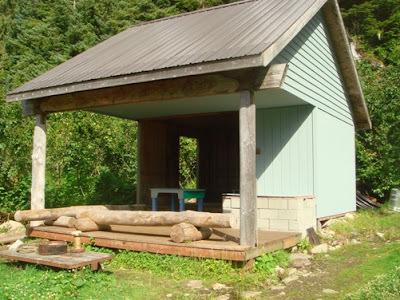 It is a basic cabin which was almost closed. 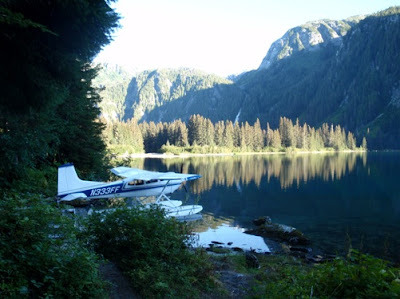 With the help of Baranof Wilderness Lodge (800-613-6551) and Harris Air (907-966-3050) the Forest Service made a huge effort to save it. New windows and major structural work were required. 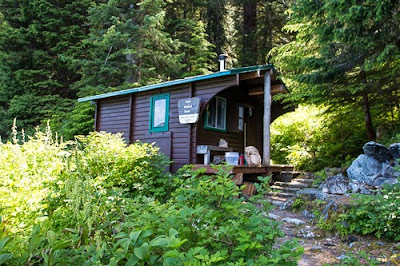 If you are interested in great fishing in a great atmosphere give Baranof Wilderness Lodge a call. Normally they book far in advance but if they can fit you in they will. 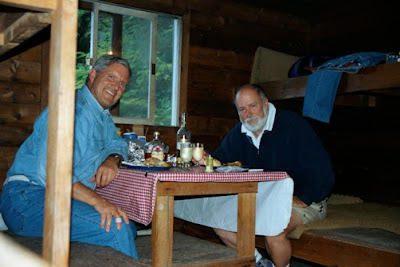 In 2008 we came into the dock and the weather created a situation where we could not leave or get to the cabin. The Lodge put us up along with a great meal for a fair price. Surprising to me most lodges will not do that. There are several concerns flying into the lake and into the dock. The current at the dock is almost always coming from the falls, note the way my plane is facing. Do a slow speed pass to check it out. It seems to vary from zero to six knots. At six knots I have a person on the plane float and do not turn off till they have a secure line. At the top of the falls on the east end of the lake there is place you can tie up. Not great but for an hour soaking in the hot spring it is fine as long as it is not blowing. Landing in the lake the first time has a few issues. If you have a 3000 foot ceiling fly over the west end of the lake and take a look. It is important to check out the wind, it can be going one direction at the east end of the lake and opposite at the cabin end of the lake. Normally the wind is going from west to east. If the ceiling is low land right over the falls and taxi back. After you see the width of this area most planes can fly low with flaps and land in the west end of the lake. The critical part of this procedure is to be low (100 feet) when you pass the red square BL EP3. 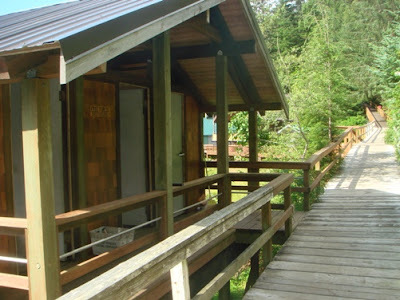 (Baranof Lake Entry Point 3). If you are too high you will run out of lake and depending on your plane you might not be able to make the turn. When leaving the cabin in clear weather I start with full power at the cabin and can clear the ridge. If you cannot clear the ridge it is easy to fly down the lake. If you cannot see the top of ridge I fly out at about 100 AGL until I get to the east end of the lake, if it is not clear over the ocean I can land. View from cabin to west. Dock in Warm Springs Cove. Building hot tubs are in. Day shelter in warm springs cove.